What’s not to love about a mariachi owl, chameleon cowboy, or a rattlesnake outlaw? 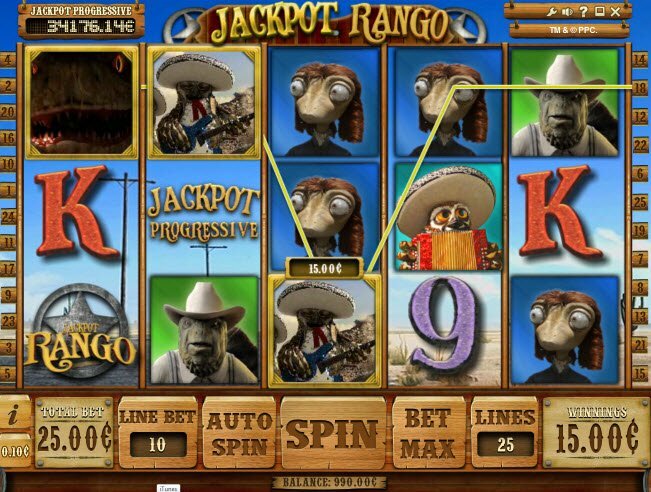 Now you can continue to enjoy all the unusual animated characters from the movie with the Rango Slot Machine Online. Keep the reels spinning and you could be the lucky progressive jackpot winner! Powered by the iSoftBet software platform, the Rango Slot Machine draws inspiration from the 2011 animated movie starring Johnny Depp about a chameleon that accidently ends up in the town of Dirt, a lawless outpost in the Wild West. The game contains 5 reels and 25 paylines, and the top-notch graphics come directly from the film. In addition, the game features a progressive jackpot with a prize pool that keeps growing with more and more cash! Nowadays it’s pretty amazing to see the amount of detail and sophistication involved in computer animated films. If you’ve seen the movie, you can appreciate the cleverness and quality of the graphics. 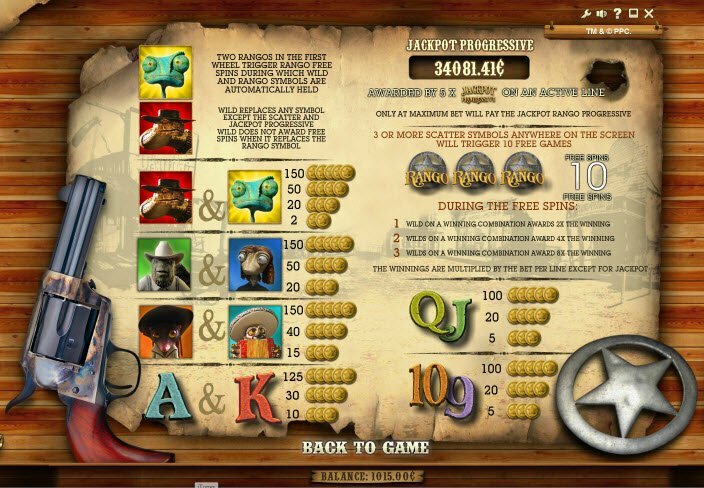 The Rango Slot Machine adapts the complexity of the film’s animations making this a superbly designed online game. You’ll love the quirky critters personified into cowboys, prairie girls, outlaws, sheriffs, and other stereotypical characters of the Wild West. In the background a bango plays music, further capturing the atmosphere of a desert outpost. You’ll love the quirky critters personified into cowboys, prairie girls, outlaws, sheriffs, and other stereotypical characters of the Wild West. 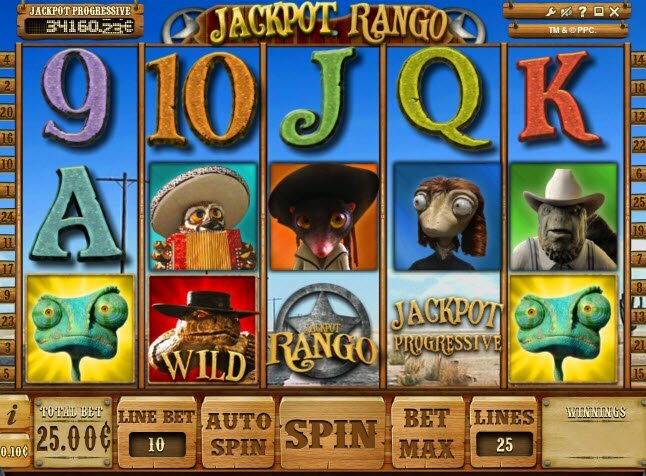 Although the online Rango slot machine lacks some of the more sophisticated game features such as a bonus game or gamble round, there are still plenty of bonuses to enjoy. The Rango slot machine has unique rules in which the combination of different symbols can still product payouts. The rattle snake serves as the Wild symbol, which replaces any symbol except the scatter and jackpot progressive. Two Rango slot bonus symbols in the first wheel trigger Rango free Spins during which Wild and Rango symbols are automatically held. The Rango insignia represents the Scatter Symbol. 3 or more Scatter Symbols anywhere on the screen will trigger 10 free games. During the Free Spins the winnings are multiplied by the bet line meaning you could cash in big. Perhaps the best feature of the Rango Slot Machine is the jackpot progressive which keeps on growing by the minute. The cash award is awarded by 5 symbols on an active line.